When Johnny Weissmuller Was Tarzan! When Johnny Weissmuller was Tarzan he would break the hunters rifles in half. But when they were in trouble he always ended up helping them, although my Dad said it was because Jane told him to. Dad said he wasn’t under the thumb, he just knew how to look after his Jane. When Johnny Weissmuller was Tarzan he protected the ancient elephant graveyard with his life. My Dad said that the hunters who searched and tried to trick Tarzan to find the elephant graveyard would always be poor. Even with all the money in the world. When Johnny Weissmuller was Tarzan he was the richest man in the world. Jane and Boy really loved him and he loved them. Apart from the times when the hunters tried to screw him over, his life was brilliant. And the Earth and the animals seemed a lot safer. 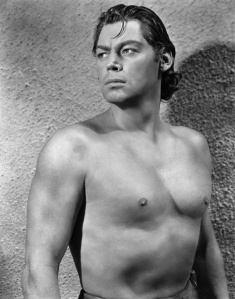 Can’t help wishing Johnny Weissmuller was Tarzan again.